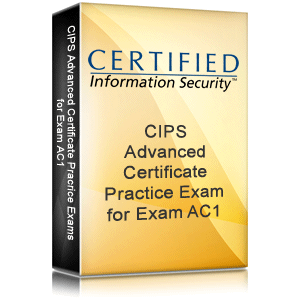 AC1 CIPS Practice Exams and Questions; CIPS training. Pass guarantee. SKU CIPS_AC1_PA. Use these practice exams to ensure your success with the CIPS certification exam AC1 for Procurement & Supply Environments. This subscription provides 30 days of access. Terms of Service: Unlimited utilization of this course is provided for a single user for 30 days in duration from the time of purchase according to the terms of Certified Information Security's End-User License Agreement. The subscription expires 30 days after purchase. Subscription time is not banked, and can not be "frozen", deferred, or re-scheduled. CIS is a registered CIPS training center now offering online practice exams to help you prepare for your CIPS examinations. CIPS examinations are expensive, and are only offered a few times each year. Get the preparation and training you need to ensure you are fully prepared for your exam! A very good practice before the exams. This practice help me a lot ! !